We secure our products with lightweight, non-toxic, and superior grade packages. The packaging is done using the latest technologies and guarantees full protection to the product. In our warehouse, we store the entire lot under a safe environment and our unit is facilitated with all required amenities ensuring complete safety of the products from different kinds of damages. 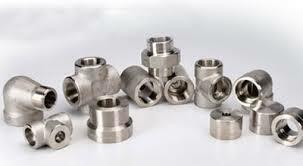 Rajshree Overseas is one of the pioneer dealers and exporters in offering Nickel Alloy Forged Fittings in Mumbai. we also offer these Nickel Alloy Forged Fittings in different sizes, shapes and designs as per customers’ specifications at affordable rates. These Nickel Alloy Forged Fittings offered by Rajshree Overseas is a solid - solution binary alloy, and as nickel and copper are mutually soluble in all proportions.